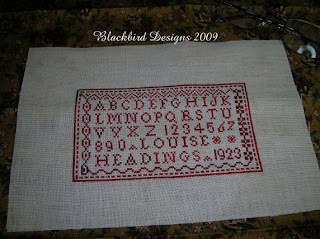 I know from reading other blogs that everyone seems to be hurrying to finish this little sampler - Here is my version - I used my Mother's name and birthdate, Lt. Expresso 36 ct fabric, and Vikki Clayton silk fibers - three colors of red although they are very close and it is hard to see the difference on my picture. Thanks for looking! This is just lovely, love your personalization!